Scanning for High Volume Stocks is interest of everyone. But scanning stocks manually from the 1600 stocks is literally time consuming and it is one of the primary requirements of Mr.Brahma Navaluri one of the regular reader of marketcalls.The one way is to write the simple afl exploration code to reduce the time of scanning high volume stocks. Let see the conditions require to write the afl code. Thanks for the AFL. Does it work for intra-day also? It wont be a good Intraday Realtime Scanner. Any how it suits for Daily and Weekly Timeframe! Could you please write an afl which would give the hi and low for a period that we choose like weekly, monthly and yearly if also possible. Also afl for gann 45 degrees lines would be of great help. i am not supposed to invest for ami original but do u have any idea about crack of amibroker (5.20,which is available) sir. also afl like ichimoku or other buy sell signal afl. will these work for trial version of amibroker. This Afl is not working, Kindly check. 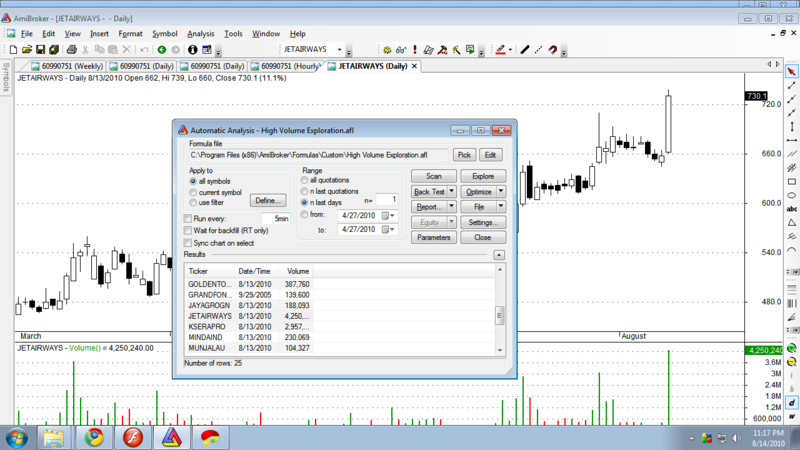 Can you help us in adding an exploration condition to an AFL we have to filter out the symbols based on certain two parameters on a 10 minute chart ?.Prently , we are doing it on a manual basis. I am searching for a volume indicator in afl which can trace average volume for the last 20 days and daily volume accumulation starting from 0 to max volume of the day in an intraday chart. The purpose is to study the price response when the daily volume touches the average volume. Doesn’t the above code only work after the market hours are over because if the timeframe is set to daily, then candle will only be formed after 3.30. Isn’t it possible to know the total volume of running trading session in real time so that if volume condition is met on suppose, 10.30 AM then it generates alert at that very time and we don’t have to wait till 3.30 PM for the candle to form.